Parents are always looking for the best ways to take care of their children. Their kids’ teeth are no exception. Your child’s first visit to the dentist is very important as it sets the stage for their future dental experiences. Please don’t make the visit scary or punitive for any reason.Many of the nervous adult patients that we see developed their anxiety during childhood and adolescence. When kids are young, we have the opportunity to make their first visits to the dentist something that is enjoyable and fun, this can help prevent the anxiety that many patients carry with them into adulthood. This is why it’s so important to find the right office! Dr. Tracy and her team enjoy working with kids to provide them with the preventive care, education and treatment they need to develop great lifelong oral health habits. What can we expect at our child’s first visit to the dentist? The American Academy of Pediatric Dentistry recommends that your child be seen when the first tooth appears, or no later than his/her first birthday. The first visit is an opportunity for the clinical staff to take a look at a child’s teeth and gums and get them used to the idea of coming to see us. We will take a ride in the chair, count their teeth and maybe get a chance to see what the polishing brush feels like on their finger or gums. It is important for parents to remember that these early visits will be setting the stage for their child’s impressions of the dentist for the rest of their life. Making a child’s first visits to the dentist a fun and pleasant experience sets the stage for developing a fear free attitude towards the dentist, and we’re here to help make that happen! What can you do at home to help develop good oral health habits in my kids? Good oral heath habits should start at a young age. Your infant’s mouth can be cleaned after each feeding. You should start brushing your child’s teeth as soon as they begin erupting. Get a soft bristled child’s toothbrush and gently brush your child’s teeth. 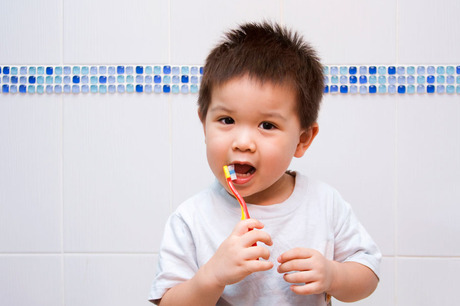 Toddlers (2-5) should be able to start brushing their own teeth with a parent’s help. Brush their teeth in the bathroom where they can see what you are doing and begin to understand what they need to do. Encourage your child to brush their teeth at least 2 times per day, for two minutes each time. Make sure to use a soft bristled brush; harder bristles may be too rough for a child’s mouth. Your child’s toothbrush should be replaced every three months, or sooner if it is worn out or frayed. Teaching a child proper oral hygiene habits can have a lifelong effect. Children who develop this habit early have a great chance at continuing the habit throughout their lives. At Willow Lake Dental, we would love to become your dental home. Come check out our clinic and see what makes us a great place for you and your family.